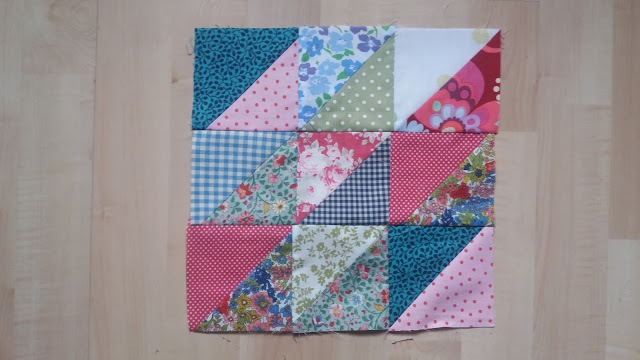 Crazy quilt blocks are by nature of their title, a bit crazy. I was given an acrylic template by my Auntie but had never used it. 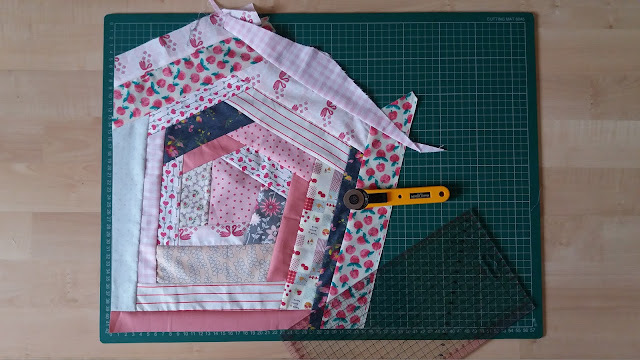 I looked up a few tutorials and dug out my longest, thinnest scraps from the patchwork box. You start by cutting the centre shape. Then apply strips to each side ironing them down as you go. You work clockwise and keep adding more and more strips. It is really hard to explain; if you want to have a go watch this brilliant video. Eventually you will get a piece that you can cut a 12x12" square out of. 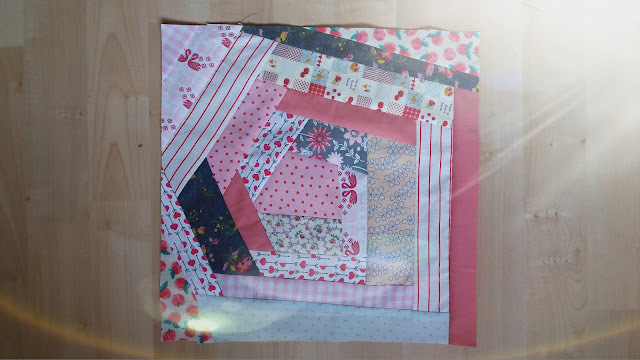 The third block in Meg's Sampler quilt uses up some left over Half Square Triangles (HST) These ones did not make the cut from my first double bed quilt for various reasons too small, wrong colour etc. but I have trimmed them down to make a 12X12" square. 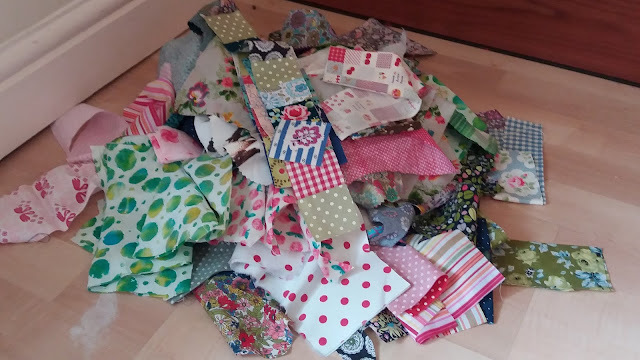 There is still a happy pile of scraps to keep me going for quite a few more blocks yet and this is the 'small scraps' box. 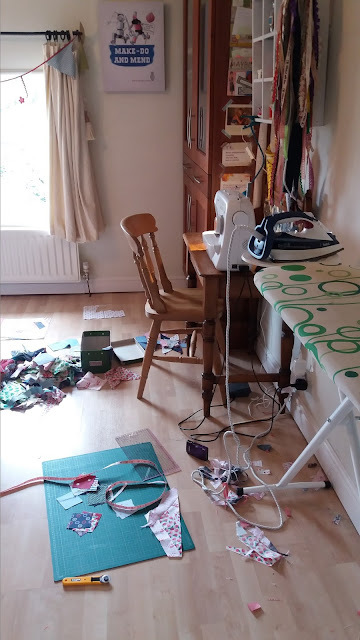 I have a 'large scraps' box - I am a bit like that when it comes to fabric organising! I had to stand back and assess the damage! It was time to clear away before I picked up the little ladies from school. Block number 3 and 4 - A crazy quilt block and a HST block for Meg's sampler quilt. Those both look great. I recognise quite a few of those scraps. That final photo is great! There is always a bit of chaos with creativity. Your quilts are coming along nicely. The last photo made me smile, I am so missing a little chaos in my life at the moment. The sooner these boxes are emptied the better. Love the idea of a crazy quilt, the block looked amazing. Lovely blocks and a brilliant photo of the aftermath. What a great way to use all those scraps. They are lovely blocks! Enjoy your quilting!